The Columbia Series 2000 thermal break primary aluminum window is designed for single dwelling through multi-family units. This window is manufactured in standard sizes for new construction, or custom sizes for retro fit applications. The Columbia Series 2000 aluminum window is a high quality affordable choice for new construction or replacement windows. General: The series 2000 single hung thermal break aluminum window units are SH-C35. The windows shall comply and bear the quality certification label in accordance with the ANSI/AAMA certification program 101-93. Material: The Columbia Series 2000 aluminum window frames and sash members shall be aluminum alloy 6063-T5 within commercial tolerances. Frame and sash members shall have a thermal barrier. The internal fins will have suitable break off and nailing grooves. Finish: Standard finish shall be of electostatically applied baked enamel. White and bronze are standard finishes..
Construction: All joints of frame and sash members shall be neatly fitted, securely connected and permanently watertight. Frames shall have step point construction for maximum rigidity. Both frames and sash members shall use an extruded screw boss that is an integral part of the extruded section. The operating sash shall interlock at both meeting rail and closing jamb. Sash shall be easily removable from inside when in open position and not removable when in locked position. 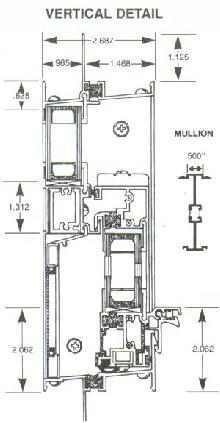 Mullions to be furnished as required. Fixed and movable sash use drop in type glazing. Weatherstripping: Weatherstripping shall be high density, silicone treated, polypropylene with a double mylar fin running through the center of the pile. Weatherstripping to be located on all four sides of operable sash to enhance maximum air and water infiltration protection. Bulb vinyl to be located on exterior of sashes at sill for weather tight seal. Hardware: All fasteners, screws, rivets and other miscellaneous fastening devices shall be of aluminum, stainless steel or other non-corrosive material compatible with aluminum. Single hung balances shall provide a positive lifting force, shall operate freely in both directions and shall hold the sash stationary in any position. Coil spring type balances are standard. 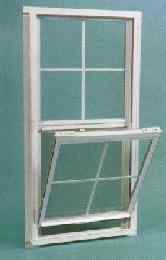 Screens: Screens shall be available on Series 2000 windows and shall be easily installed or removed from inside without removing operating sash. Screen frames shall be aluminum sections securely joined at the corners. Screen cloth shall be 18×16 mesh charcoal fiberglass. Glazing: Aluminum windows shall be glazed with 7/8″ double or triple sealed insulated glass. Also available: bronze tint, low E, and muntin bars between glass at an extra charge.